Dorset-Airport-Cars is a Bournemouth based taxi company specialising in long distance chauffuer driven trips to airports, docks and railways throughout England. Allthough we specialise in airports we are more than happy to quote for any UK destination. 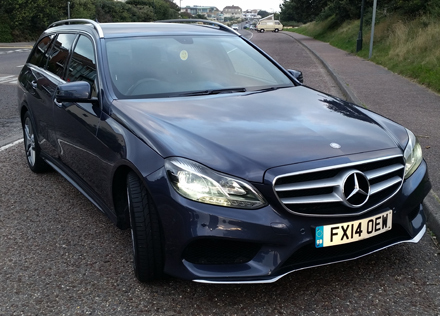 For the ultimate in reliability and comfort we use a Mercedes E300 Hybrid Estate. Fitted with full leather interior, digital climate control and comfort suspension it is an extremely pleasent ride. Our most popular destinations are London Heathrow Airport, London Gatwick Airport, Bournemouth International Airport, Southampton Airport and Southampton Docks. Just pick up the phone or complete the very simple 'Enquiry / Booking' form on the tariff page. We undertake work for private individuals and corporate clients. All our drivers are all fully licenced and insured, and all our vehicles are clean, well presented and well maintained. We pride our selves on reliability, punctuality and a high degree of professionalism.